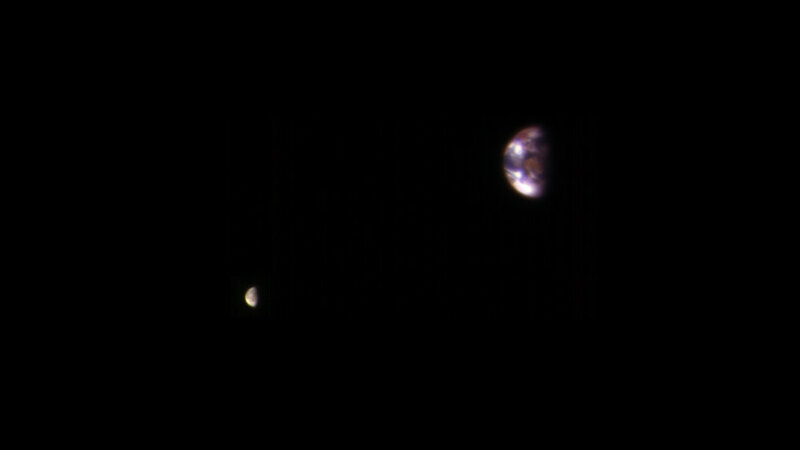 The image combines two separate exposures taken on Nov. 20, 2016, by the High Resolution Imaging Science Experiment (HiRISE) camera on NASA's Mars Reconnaissance Orbiter. The images were taken to calibrate HiRISE data, since the reflectance of the moon's Earth-facing side is well known. For presentation, the exposures were processed separately to optimize detail visible on both Earth and the moon. The moon is much darker than Earth and would barely be visible if shown at the same brightness scale as Earth. The combined view retains the correct positions and sizes of the two bodies relative to each other. The distance between Earth and the moon is about 30 times the diameter of Earth. Earth and the moon appear closer than they actually are in this image because the observation was planned for a time at which the moon was almost directly behind Earth, from Mars' point of view, to see the Earth-facing side of the moon. In the image, the reddish feature near the middle of the face of Earth is Australia. When the component images were taken, Mars was about 127 million miles (205 million kilometers) from Earth. With HiRISE and five other instruments, the Mars Reconnaissance Orbiter has been investigating Mars since 2006. The University of Arizona, Tucson, operates HiRISE, which was built by Ball Aerospace & Technologies Corp. of Boulder, Colorado. NASA's Jet Propulsion Laboratory, a division of Caltech in Pasadena, California, manages the Mars Reconnaissance Orbiter Project for NASA's Science Mission Directorate, Washington. Lockheed Martin Space Systems, Denver, built the orbiter and collaborates with JPL to operate it.